The West Sabine Bridge is down. Don't listen to the rumours or incorrect advice that The Travers Sabine Track is closed. The Travers Sabine Track Is Open. The West Sabine River can be crossed in normal flows. If it rains hard the river will come up fast and go down just as quick when it stops raining. If you have good back country skills This track can be done by most people. 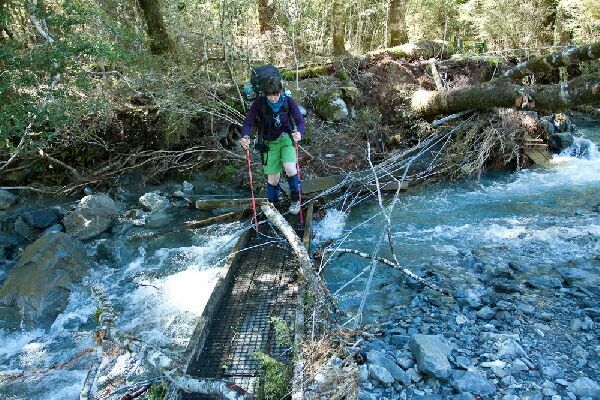 River crossings should be done with others or with caution.There will be others in the West Sabine Hut. Who with the good Kiwi back country spirit. Will be very happy to help you across or give good judgement of crossing. If you are out of your comfort zone. Back off until others arrive to help you. We used to cross rivers long before bridges. Plenty of our passengers are getting across the Sabine River with little or no trouble. Part of the bridge is still standing and will get you to a island in the middle of the river. From the island there's a large tree across the last part of the river to get you to the far bank. Remember the 3 C'S with all river crossings Caution, Caution, Caution and of course work as a team. 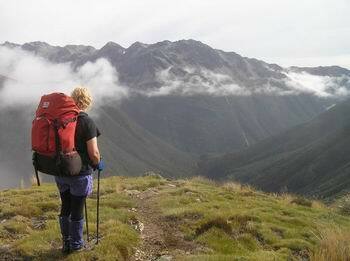 The Travers Sabine Circuit is one of the most popular walks in the park. The best time to do this trip is late November through to May. 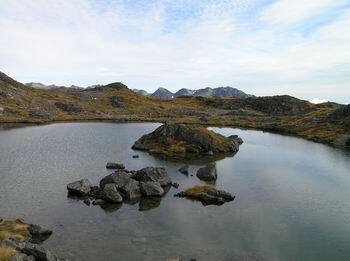 To really enjoy this tramp allow 5-7 days and plan for a side trip to the beautiful Blue Lake. 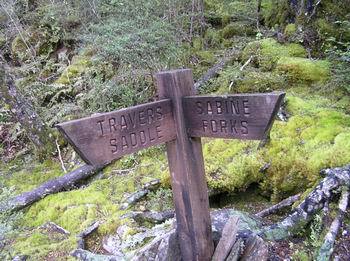 Most people tramp from The Travers to The Sabine.The Travers Pass is the steepest on the Sabine side. Be prepared for all weather conditions. Even in summer it snows at least once a month on the tops. May through to October is more suitable for the experienced tramper.You need to carry an ice axe and crampons.Also the skills to use them. It is advisable to contact DOC for avalanche and snow conditions before entering the park. Water Taxis operate on both Lakes. We recommend using both of these services and spend the time saved by exploring Upper Travers and Sabine Valleys. See the contact details below. They both operate an on demand service all year around. Both operators are skilled and have good knowledge of the Park. 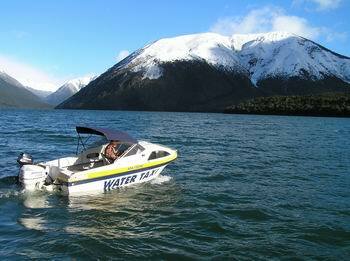 There is a radio at both Sabine & D'Urville Huts for contact with the Lake Rotoroa Water Taxi. Vodafone has coverage at the Sabine Hut. 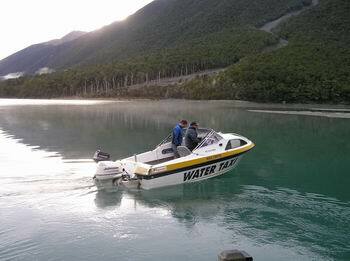 Nelson Lakes Shuttles can also meet the Water Taxi at Lake Rotoroa. 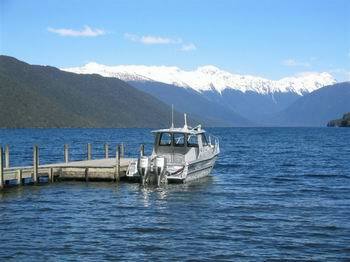 Nelson Lakes Shuttle can pick you up in Nelson, Blenheim and Picton. Transport you to any Track Head in the Park. If you are using the radio at Sabine or D'Urville Huts the Water Taxi operator will also ring Nelson Lakes Shuttles to meet the Water Taxi at Lake Rotoroa. While you are waiting for the shuttle. Walk down to the Gowanbank Backpackers and indulge yourselves at their yummy cafe. 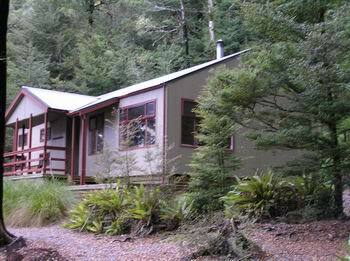 Clean Comfortable and Affordable Accommodation at Lake Rotoroa Check out their place by clicking on the following link. 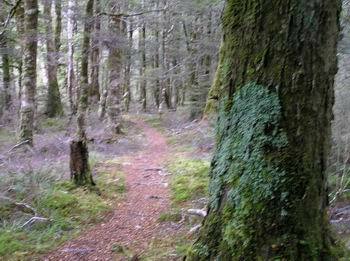 Starting at Kerr Bay this track follows the eastern shores of Lake Rotoiti and it's a easy stroll to Lake Head Hut. 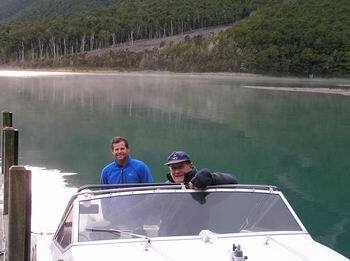 Plenty of bays to stop and admire the views of Mt Robert, Hopeless and Mt Travers. For those of you that are brave enough to test the water there are many safe beachs to swim from. 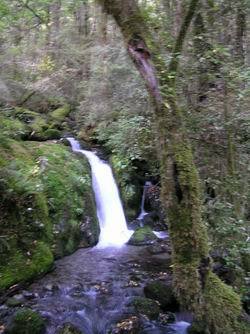 As you walk through the Rotoiti Nature Recovery Project you will be rewarded with abundant bird life. Take the time to look up into the trees and you may be rewarded with a cheeky Kaka frolicking in the tree branchs. 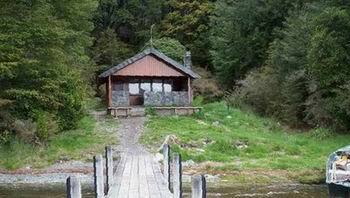 Lake Head Hut stands in a clearing about 10 minutes from the jetty. 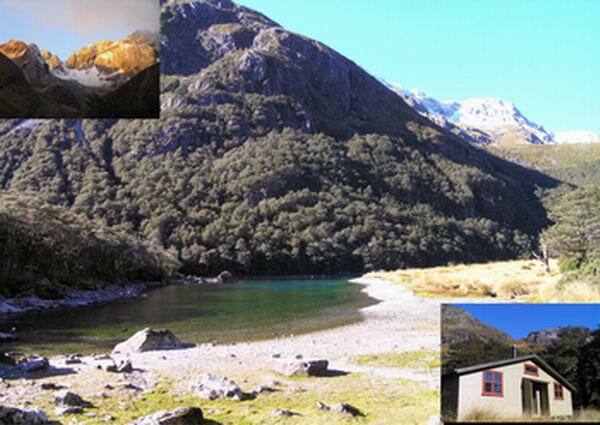 To save the 1 hour road walking from St Arnaud Village to Cold Water Hut track head. Book one of our shuttles or get a friend to drop you off. This track gives you faster access to the Lake Head and the recently renovated Cold Water Hut. DOC have done a good job of upgrading this hut. So it now sleeps 12 and is very cozy on the coldest days. Although there's not so much bird life on this side of the lake. Whisky falls and the stunning lake reflections make up for this. The other advantage is if the Travers River is in flood you are on the right side of the river.The flood track on the true right is not one of my favourites.The main Travers Sabine track stays on this side of the river to John Tait Hut. 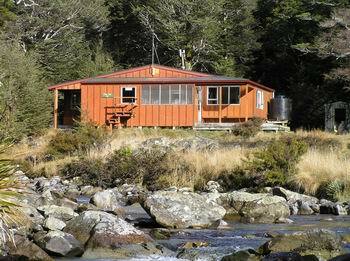 To access the main Travers Sabine Track you must cross the Travers River just above the hut. If the river is in flood DONT attempt to cross it. It moves deceptively fast and will soon have you off your feet. There's a flood track from the hut that follows the true right for about 1.5 hours to the Travers Swingbridge. It's a bit boggy and adds a small amount to your walking time. But it's a better alternative to the flooded river option. This section of the track starts with some nice river flats and forest clearings. Often getting some tantalising views of the surrounding peaks. Soon the valley starts to close in and once you've reached the Hopeless Creek Track turn off the track starts to get steeper with the added adventure of negotiating tree roots and rocks. Just when you almost had enough walking John Tait Hut materialise as you walk into a large clearing. 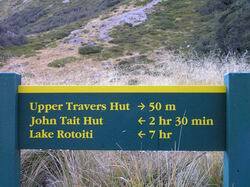 It's only three hours walk from John Tait to Upper Travers Hut. But it's time to stoke that boiler as you gain a lot of altitude in that three hours. 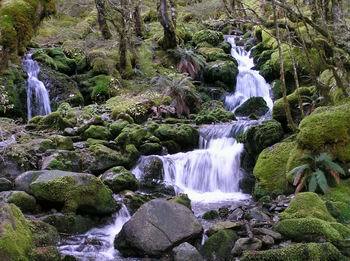 The impressive 20 metere Travers Falls are worth a side visit. These are marked not too far above the Cupola Track turn off. Not long after the falls turn off you get a bit of respite as the gradient eases off. As you pass through a number of regenerating scree slopes. Every now and then you will be rewarded with some views of Kehu and surronding peaks. Take the time turn around and look back. 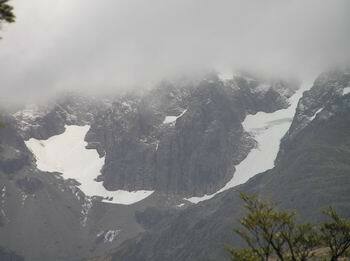 On a clear day you will be rewarded with a view of the only surviving glacier in the park perched high on Mt Hopless. Soon you cross the now small flowing Travers River to the true right. 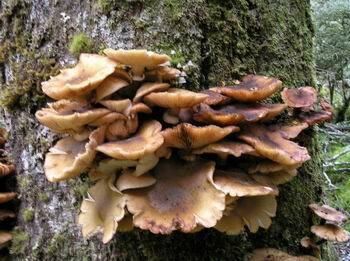 Only another 30 - 45 minute grunt up through the forest and climbing around avalanche damage from the winter of 2004 you suddenly pop out of the tree line. You are suddenly awed by the impressive Travers Valley Head, with the majestic Mountains Kehu and Travers standing gaurd on each flank. 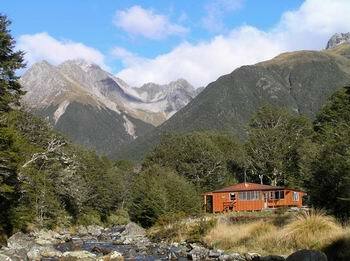 The hut is tantalising close on the other side of the tussock clearing. So it's a wobbly stumble across this lumpy tussocks with the odd hole to throw you off balance for that last undignified stumble to the well appointed Upper Travers Hut. Some people push onto West Sabine Hut. More fools them as this makes for one long day. 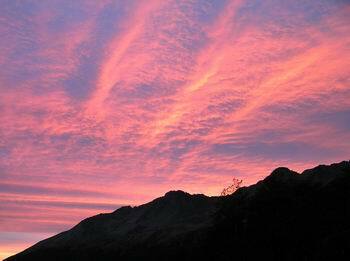 This area is at least worth a half day exploring the near by tarns and saddles. 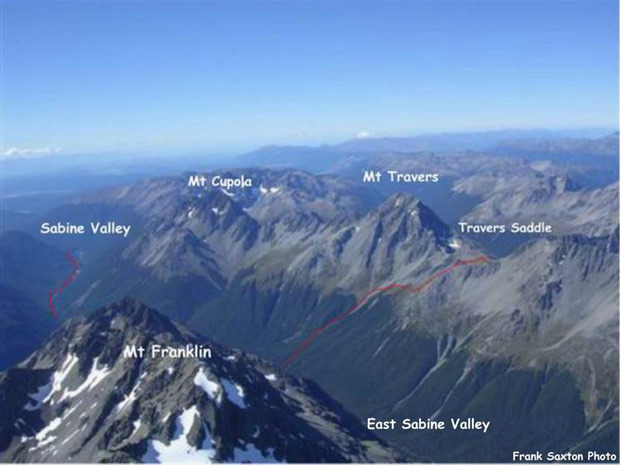 A good suggestion is to have a quick lunch and climb Travers Saddle (you may not see it clear next morning). Explore the tarns just off the track about 10 minutes towards Rainbow Pass. 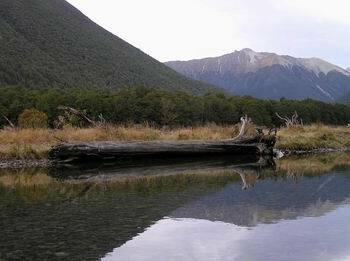 Wonderful reflections of Mt Travers and if you follow the outlet you will get some impressive views of the Travers Valley. For those with extra energy and rock climbing skills. 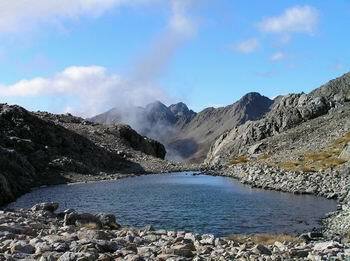 Go past the tarns to Rainbow Pass and climb the peak on the left.You will not be disappointed. Of all the Saddles and Passes I've traversed in this Park. I have to say that the Travers Saddle would be one of the most demanding. It seems to be one of those tracks that goes on for ever and you have those repeating thoughts racing through your mind "are we there yet". Don't let me put you off as there's nothing difficult with this route. On a clear day the views are stunning, with the south face of Mt Travers towering over you and the impressive highest peak in the park Mt Franklin overlooking the remote East Sabine Valley. 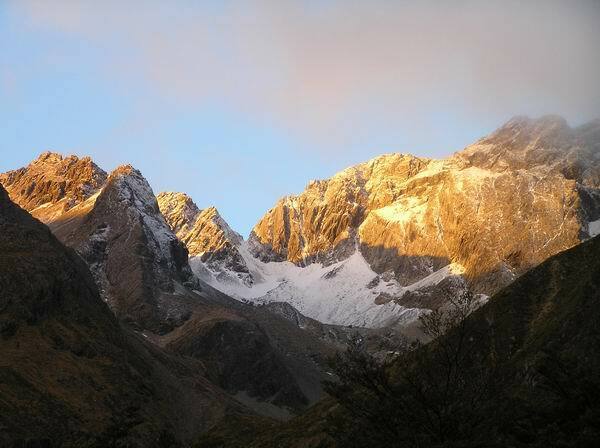 But be prepared for snow conditions, Travers Saddle can receive snow at any time of the year. In fact one Christmas they had waist deep snow. This happens rarely. (But who knows when it will snow). The descent of the avalanche chute into the East Sabine Valley certainly takes it's toll on weak knees and stamina. Very few reach the bottom without that all familiar "wobbly knee syndrome" Walking down the chute is like walking on a bed of marbles (walking poles should be considered) and I think the cruelest part about this track is that once you have reached the Sabine Stream you think it's going to be flat all the way to the West Sabine Hut. What a way to be taught about "Hanging Valleys" The East Sabine Valley is your classic reminder of this geological phenomenon. By the way your knees will be screaming this reminder as well!!!! But what a good nights sleep can do to ones battered body and next day the pain of Travers Saddle is behind you (slightly !!!). For the budding geologists keep an eye out for the Travers Fault line. It runs just below the saddle north to south. 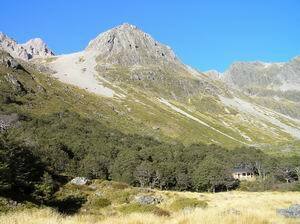 Best to make a early start from Travers Hut and allow 6 - 9 hours tramping time. Remember it's not a race and there are plenty of exciting things to see on way. The route is poled over the saddle to the bush line in the East Sabine Valley. A good steady 1.5 hour climb to the saddle. 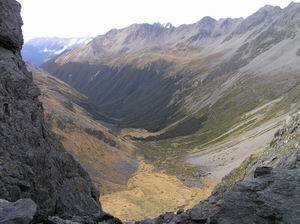 Then a 15 - 30 minute descent through lumpy tussock and scree before you reach the bushline and then sidling around to the knee bashing descent of the avalanche chute down to the East Sabine River. The track follows the true right for a while crossing many moss encrusted trees rocks and photogenic streams until you come to bridge spanning thundering 35 meter deep chasm. 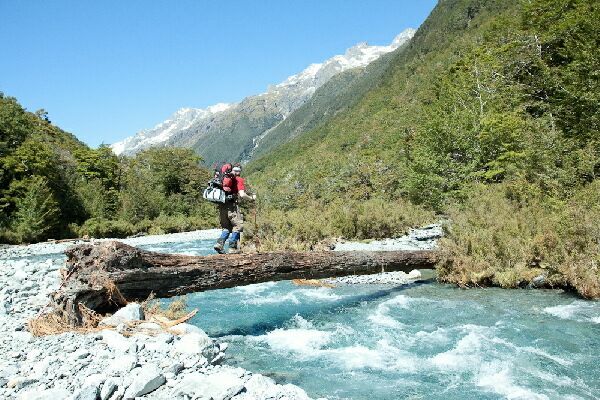 Give a thought to the early trampers who probably had to cross this on a log. 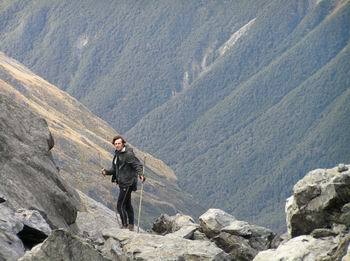 The track climbs steadily above the chasm before that last cruel steep descent to the floor of the West Sabine Valley. 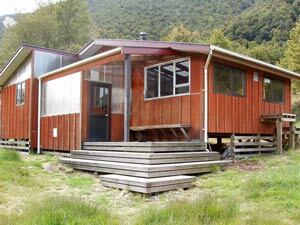 Once you have regained use of your very wobbly knees it's only another 5 - 10 minutes walk to the palatial West Sabine Hut. 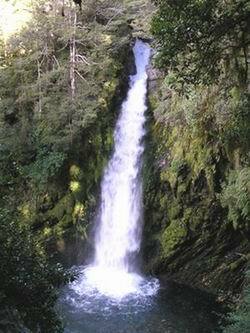 Keep an eye out for a impressive waterfall that tumbles down from the opposite side of the valley just below where the east Sabine River emerges from the inky black chasm. If you have the time Blue Lake Hut is a place you have to put on your "to do list" I suggest creating the time to at least spend one night here. I have been to Blue Lake Hut many times and it still draws my breath away. Take water taxis on both lakes so you can claw back the time to do this trip. 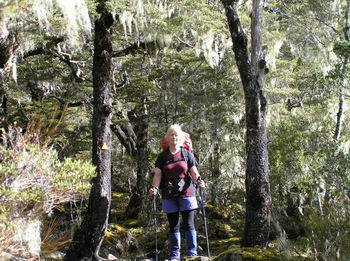 Three good day trips from Blue Lake Hut are Moss Pass, Waiau Pass and Mt Franklin (need good climbing experience for Mt Franklin). If you don't have the time for a day trip. At least climb up to Lake Constance and marvel at the eathquake rubble that fills the valley as a dam to form this impressive lake. Look hard enough and you can see where the rubble blew out from the mountain side. 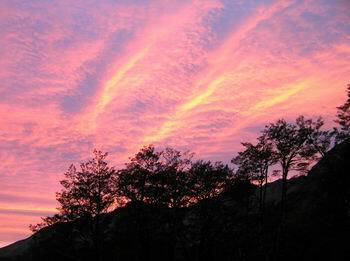 Some nice private campsites can be found next to Blue Lake (second heaven). From West Sabine Hut cross the river in front of the hut or take the swing bridge down from the hut if you don't like cold wet feet first thing in the morning. The track keeps to the True Left all the way up to Blue Lake Hut. 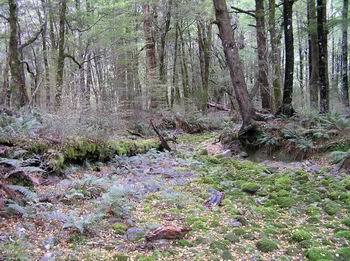 First of all passing through beautiful mossy green sections of beech forest before emerging into a serious of open clearings scree slips. Plenty of water falls and mountains to keep the camera clicking. Check out the huge rocks laying in the valley floor. After about 2 hours walking the river suddenly becomes a small bubbling brook and forks just below the bluffs of Moss Pass and it's impressive waterfall. Cross over the fork that goes up to your right (looking up stream) which is a notorious avalanche chute. Often there's still avalanche debris sitting in the valley well into March. The river carves a tunnel through the ice and snow. Climb up a small steep grunty section of scrub on the true left of the left fork. 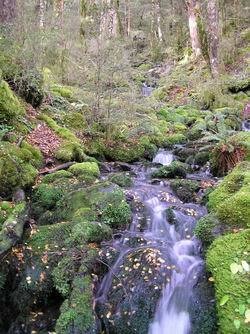 The track levels out for a short while passing through a truly enchanted forest complete with small tarns and a burbling brook. Just one more small steep climb to Blue Lake Hut. Travel down the West Sabine Valley is simply a walk in the park after the effort of crossing Travers Saddle the day before. I'm sure your knees and leg muscle will agree. Cross the swing bridge below West Sabine hut and turn right. The track keeps to the true left most of the way down until you get to the gorge. Plenty of deep pools to spot trout or swim in. There are a number or large clearings to pitch a tent or stop for lunch. The track climbs steeply just before the Sabine Gorge and down again to a small impressive bridge spanning the narrow gorge it's self. The blue green waters are very tempting for you to jump in. Yes it's deep and very very cold!!! 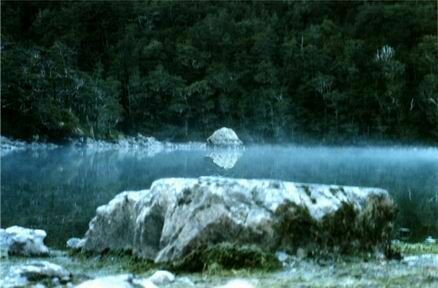 Often you can spot a couple of very large trout in this pool. Many have tried to catch them and many have failed. That's why they are so big and hopefully stay that way. 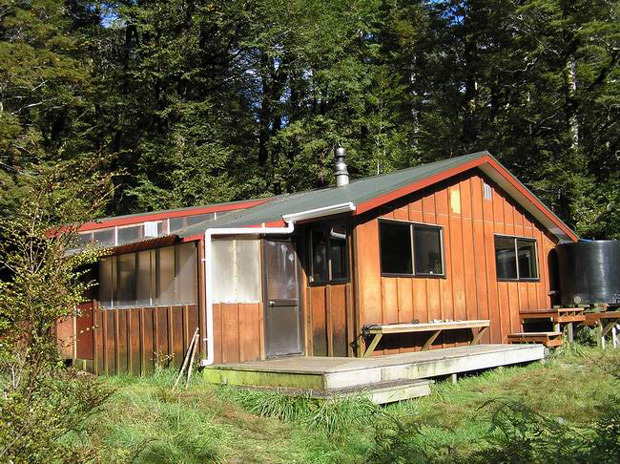 The Sabine Hut is only about another 15 - 30 minutes from the bridge. There's a nice clearing beside the Sabine River about 10 minutes before the hut for those who like camping and solitude. Beware the sand flies are very friendly and can strip you to the bone in minutes. There are two other ways you can exit the Park from this point. 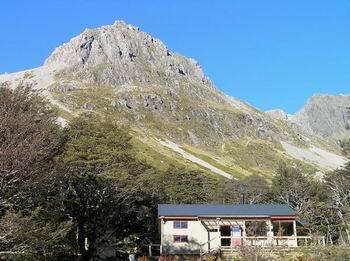 Up over Mt Cedric to Angelus Hut or call the Water Taxi. There's a radio in the hut or use your cell phone (Vodafone only).To get a good cellphone signal go out on the deck. From the hut follow the shores of Lake Rotoroa and taking care not to take the Lake Rotoroa Track. 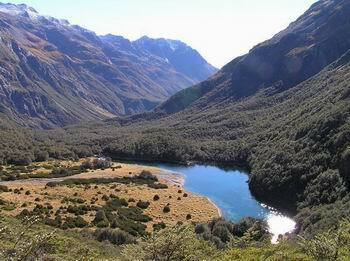 The track quickly leaves the shores of Lake Rotoroa and climbs steadily for one hour before reaching the Howard Saddle. 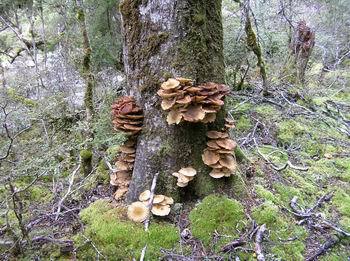 Then it's sidles around gullies and over rocky tree root country until you come across a well formed track. The board walk ending with a seat on a viewing platform really blows you away. On a good day you get some great views. 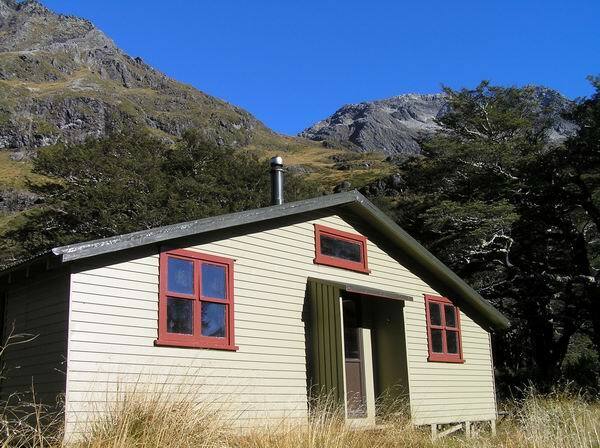 Speargrass Hut is situated in a lovely tussock clearing with great views up and down the valley. 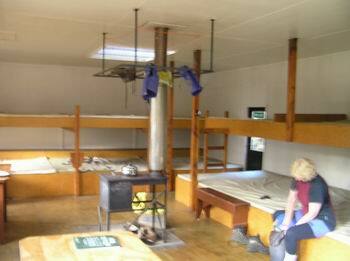 It only Sleeps 12 and can be quickly crowded in the summer season. If the weather is bad forget attempting the Mt Cedric / Lake Angelus route. It's very exposed and you will see nothing. There's always another day and believe me it wont wear out before you come back. Carry onto Sabine Hut and if the weather improves take this marked route up to Angelus. This track gives you no mercy from the beginning. Almost from the hut door you are straight into the steep climb. The idea is to leave early and take plenty of water. There's no water on this section. The track plods on ever so upwards to the tree line and pops out onto the lower tussock slopes Mt Cedric. The Cedric Ridge is long and very exposed. The views from this ridge on a clear day are just stunning. 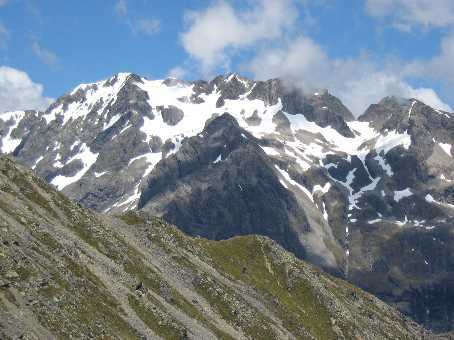 Looking straight up the Sabine Valley with views of Mounts Hopless, Cupola, Franklin, Misery and Mole Tops. Also a panaramic views of lake Rotoroa. From the just below the summit of Mt Cedric the track picks it's way down through jumbled rock with views of Lake Angelus, Mt Angelus, Sunset Saddle and the photogenic Hinapouri Tarn. Keep to the eastern side of the lake until you come across the hut perched on a peninsula. Lake Angelus is another one of those special places. But unfortunately everyone else seems to know about it. So it can be crowed in the summer and comes with it's own friendly hut warden. Try to spend a extra day here and climb Mt Angelus. 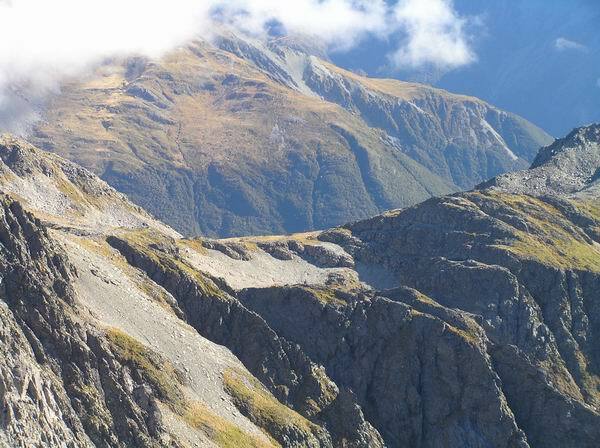 On your way back climb down to Sunset Saddle the sidle over towards the ridge leading to Mt Cedric and you will be rewarded with a different view of Lake Rotoroa, Sabine & D'Urville Valleys. From Angelus Hut there are another four options to exist the Park. 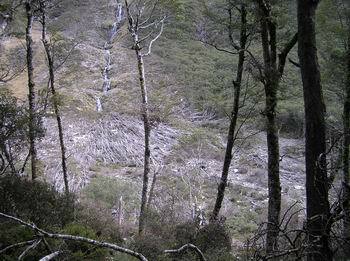 Robert Ridge (the most common route), Speargrass (Bad weather Track), Hukere Stream (Bad weather Track) or Hopeless Valley. Just below Speargrass Hut pass the turn off to Lake Angelus and cross the footbridge spanning Speargrass Creek. There's a small muddy section after the bridge to be negotaited with caution. Some of the bogs can be thigh deep and remove the best fastened boot. A good track leads you down to the valley floor and then follows the river for some distance. Yes there's always the last up hill section. A cruel 30 minute climb and sidle leads you out to the Mt Robert Carpark.